I have a habit of buying fabric on the fly – without a clue as to what it will be. This is quite handy as I always can shop from home when the stores are closed. And, I generally get the shopping bug in the middle of the night and can’t rest until the stash is thoroughly searched. Nothing was quite right so decided it would be a good TV blanket. And then, one night (in the middle of ‘Masterpiece Theatre’), Inspiration struck–the slots in the selvedge just begged for lacing. But what would I get by lacing both selvedges together? Just a smaller rectangle. So it hung off the edge of the puzzle table until my Muse/consultant berated me for messing up a really good puzzle, at which time I took advantage of an available body for draping. Between the two of us, we came up with a cocoon shawl. And, it just so happens the cocoon shape has been revived again in Fashion Week 2013. For the sleeve ‘hem’, trimmed the crosswise edge around the flower motif; it’s a knit so no raveling. Gathered several (6-8) strands of yarn, craft cord, ultrasuede, etc., strung on a couple of beads for the center back and laced the selvedges together going through one layer for a couple of inches on each side of center back. Jazzed it up with the addition of small crystal gems in the center of some of the flowers. 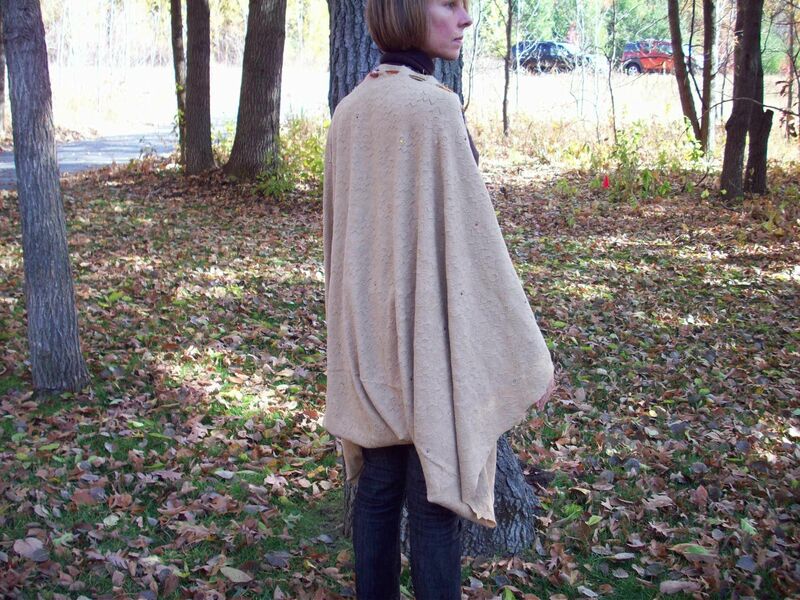 Added cord locks at sleeve hem to adjust sleeve length and VOILA – a Cocoon Shawl, available on Etsy. 2 yards (more or less) fabric; my fabric is 54″ which makes for a long shawl; 45″ width will make a shorter one. Soft knit fabric will drape and not be too heavy. Multiple strands of yarn – from my stash (yep, I am also a yarnaholic! ), cut to length of fabric; two cord locks; optional – beads for lacing, hotfix gems. Fold fabric in half lengthwise and lace together leaving one layer free across the neck; experiment with how wide the free layer should be. My fabric had selvedge slot’s from the loom; you can make slots with a Skip-Stitch blade. The Blade fits in a cutting handle (think rotary cutter) and makes equa-distance perforations. This entry was posted in FIBER FASHION FUN and tagged cocoon, shawl, skip stitch blade. Bookmark the permalink.